Sometimes depending on the mood, I remember that Very Odd alphabet rhyme by Edward Gorey: "N is for Neville, he died of ennui", only I always think it is Nigel, maybe because that was my uncle's name, but he didn't die of ennui. It's not that I really have ennui so much as that I have nothing new to write about the 'hood. 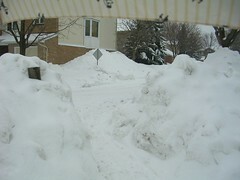 We have had more snow and more snow and today it is c-c-cold out there. Today started at minus 22 C (-8F) with a windchill of -30 (-22F). I have determined that I am not going to go outside today - it's too much bother. Two pairs of pants, two hats, scarf, mitts, big socks. I get to the point where I just don't want to any more. I am longing for all the things that Zoom mentioned in her blog about what Spring has to offer. Mostly, to be able to leave the house without boots and three additional layers. But I do have to say in its defence that the sun is noticeably, appreciably stronger. Even walking home yesterday in the wind, I could tell it felt warmer because of the sun. The Equinox is only 20 days away! 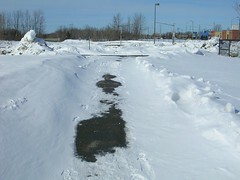 And despite the temperatures, the sun is melting the snow wherever it can get a purchase on dark pavement. 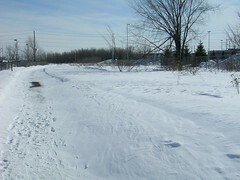 Here's the bike path behind the transit station. In spite of the cold and the blowing snow, there is still some bare pavement here and there. 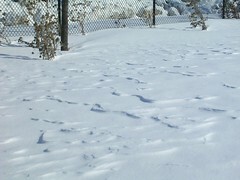 The wind has blown the snow into ripples like sand in a desert. I suppose in the desert they say the sand looks like snow drifts. The wind is relentless and blows the fine dry snow into the path. 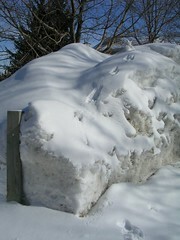 Sometimes, the snow drifts get more sculpted than in other places. At home, that snow is now above the place where the branches come out of the tree. 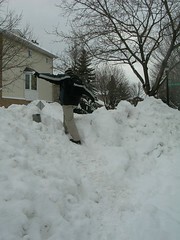 Previously, it had got close to that height but then we had the January melt. But now it is higher than ever. As I was taking pictures, I noticed rabbit tracks and it appears that this athletic bunny hopped UP the mountain of snow. On his way to where? Maybe it is a treat to be able to eat the branches high up in a tree - something a rabbit would never get to do in the Summer. At least, I don't think rabbits can climb trees. But squirrels can. 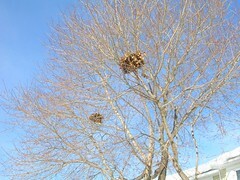 Here are two robust looking squirrels' nest. I hope they are safe and relatively warm up there today. It's always about the weather, these days. Today started out with a windchill of minus 29C so I dressed for it. Strategic layers, leg warmers, warmest mitts, a headband under the hat. I didn't carry my camera thinking, what's the use, the batteries would get too cold to work. As I turned onto the bike path and into the wind, I shielded my face from its sting with my hand. My eyes teared up and I closed them to narrow slits. Then I noticed a small brown puff of fuzz beside the path. I thought it must be a pompon fallen off something and took a step past it. Then I stopped and turned back, because I had seen the fur move in the wind, without the object itself being moved. It was right in the junction of the vertical wall of snow and the path, as sheltered as it could be from the wind, without being really sheltered. I stooped to look more closely at it and realized it was a vole. I couldn't see the tail or evidence of the nose but that's what it was. I thought it must have frozen to death in the cold and felt a pang of sympathy for the poor, wee thing. I reached down to pick it up and it came to life! The creature tried to escape away from the snow bank and toward my feet, burrowing under the arch of one boot. I steered him back to the bank and he tried burrowing in there, little bare pink feet scrabbling. Bare feet! I could see he wasn't going to make much headway, so I took my foot and stepped a hole in the snow about a foot off the path. 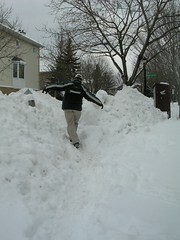 The snow was about a foot deep there and I wiggled my foot at the bottom to try to get near the grass. Then I scooped the vole up against the snow bank wall and steered him toward the hole I had formed. He plopped down into the hole and began digging down at the bottom of it. I have hopes that he made himself a better shelter and can chew on some stems of grass until it warms up a little. 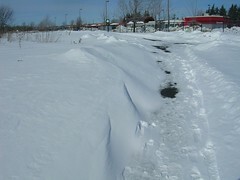 Someone had cleared the path at least as of this morning. I got a photo on the way home, when it was drizzling hard enough that I had my umbrella up. The freezing rain warning was finished by this morning and when I looked out and saw another 4 inches of snow, I figured it had missed us. So I shovelled the driveway and by the time I got home, it was all slippery from the drizzle. You can't win. Over at the construction site yesterday, I noticed they were removing foundation forms and there seemed to be more foundations. 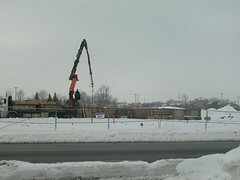 I always wonder how good that concrete is going to be in the long run, when they pour it under winter conditions. But I suppose that's why they are engineers and I'm not. 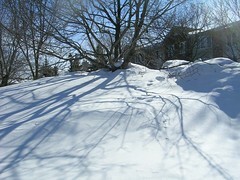 We got another foot of snow on Friday, just in time for the opening weekend of Winterlude. It wasn't that cold and the fall was slow and steady so we weren't paralyzed by it or anything. 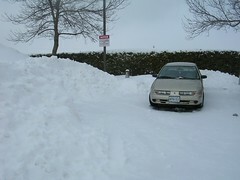 I'm glad we had that huge melt after the first storm because there really wouldn't be any place to put this fresh snow. In this parking lot, all the snow is pushed to one end and I pity the person who has the end spot. 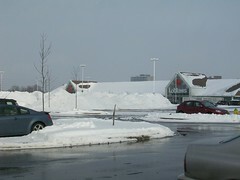 The small mountain of snow was created anew in the College Square parking lot. They haul that snow away after a while. I note that it is mild enough that the snow on the pavement has completely melted after having been scraped clear. 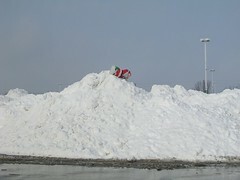 When I got up close to the pile of snow, I noticed a plastic Santa on top and wondered how it got there. This year was the first in a while where the snow clearing crew actually plowed the path between our subdivision and the next. 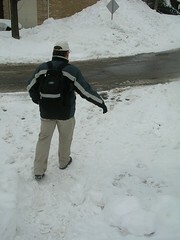 Unfortunately, nothing has been done since Friday except to push the mound of snow up against the edge of the path. Coming home from the store, I asked Peter to go ahead so I could get some scale. I took this last one teetering myself on the top of the path that some intrepid humans had made over the snow pile. I wouldn't want to try to shovel it by hand now (too densely packed) but I am hoping someone may come along with a small snow blower and clear it out before too long.